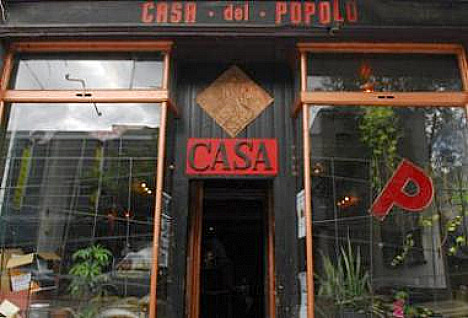 This is a letter written by the management of Casa del Popolo to the public of Montreal. I've inserted links to give you the reader ability to read more info into the subjects discussed. The letter continues after the jump, please feel free to share your thoughts on this subject. Dear Montreal community...This is Kiva and Mauro from Casa del Popolo, we just wanted to officially tell you all whatâ€™s going on. We have suspended all shows pending a court case with the RÃ©gie des Alcools Des Courses et des Jeux. So hereâ€™s the story: we currently have a restaurant liquor license which allows us to sell alcohol only when someone is eating (the quantity of food is determined arbitrarily by the inspectorâ€™s judgment, which varies with each inspector). We also currently have a bar certificat dâ€™occupation from the Ville de Montreal, this allows us to operate a bar but still does not allow us to sell alcohol without someone eating. In order to sell alcohol we need to obtain a bar liquor permit from the RACJ. This is one of the things we are waiting to be determined at our court case. Most importantly for us though is the issue regarding Spectacles. In order to have live music performances with a cover charge in a venue which sells alcohol you must obtain a Spectacle liquor license from the RACJ. We do not currently have this and up until recently there was no way for us to get one. In order to obtain this the Casa cannot touch any residential property, which the Casa still legally does. In the next few months we will be making the necessary renovations to transform our new offices to commercially zoned property as well as a few other minor changes. We have been attempting in the past few months to make these transformations without stopping shows but this is just not possible. We are VERY SORRY for this but we will be following the law. Things have worked for us for 9 years now but the recent crackdown on restaurant liquor licenses has seriously affected us and we are attempting to do the right thing. Please bear with us. There is no reason to panic or storm city hall. Suffice it to say, the Casa will remain and return stronger than everâ€¦it will just take a little timeâ€¦If you have any questions feel free to call the office at 514-284-0122 or email us at info@casadelpopolo.com â€¦. La mÃƒÂªme chose n'est-elle pas arrivÃƒÂ©e au Greenroom il y a quelques mois de cela? Hmm I guess it would be too radical for Montrealers to enjoy live music without alcohol. the bureaucracy of this province makes me sick sometimes. Dans le cas du Green Room, j'ai entendu dire qu'il y avait plusieurs plaintes des voisins concernant le bruit. It's too bad for Casa. I've seen some great shows there. La situation semble s'ÃƒÂªtre arrangÃƒÂ©e au Green Room, mais c'ÃƒÂ©tait aussi une question de zonage il me semble. J'espÃƒÂ¨re qu'il en sera de mÃƒÂªme pour le Casal Del Popolo! Thanks for the info. It's good to finally hear what's REALLY going on. It's possibly too radical to have live music not associated with alcohol, but IMHO it's not as simple as that. Alcohol acts as a reasonable source of income for bars that support independent artists or signed artists with small local fan bases. By making money on alcohol, the bar doesn't have to bill the artist absurd amounts, and lets face it, doubling the cover fee probably wouldn't go over so well. Montreal's music scene thrives because there are places like Casa Del Poplo to host the "no-name" artists. I'm sure the owners would love to do it out of the goodness of their hearts, but they have to turn a profit and stay in business, and serving meals during a show just isn't going to cut it for rent on St-Laurent.